The Anduin swiftly bears the Fellowship away from Lorien through the empty lands south and east of Mirkwood, and toward Rohan’s northern borders. Even though the land is peaceful, the group feels exposed, and for long periods seem to drop into moody introspection. Their fears may be prescient when, first, they discover that Gollum is trailing them, and then the group is attacked from the river’s northern shore as they unexpectedly strike the Sarn Gebir rapids. What do we make of the attack? Gollum’s work, or just coincidence? What is the Winged Shadow that Legolas shoots down with the bow of Lorien? And why does Tolkien includes seeming asides such as the eagle that they company sees flying high in the air? Join us tomorrow (Saturday, August 18) at 6.00pm ET (New York time), when we’ll discuss all this and much more as we continue our Fellowship of the Ring read-through! 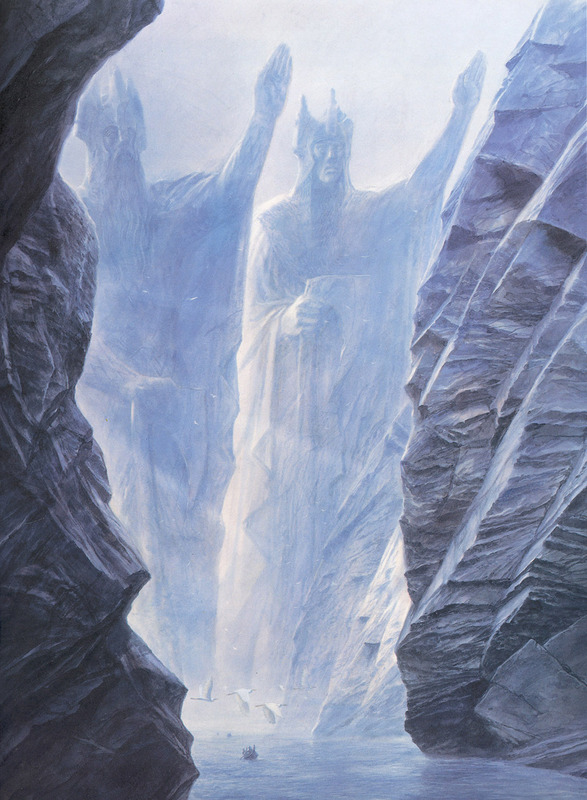 The Argonath by John Howe.